In a new interview with the New York Magazine over the weekend, Zachary comes clean. 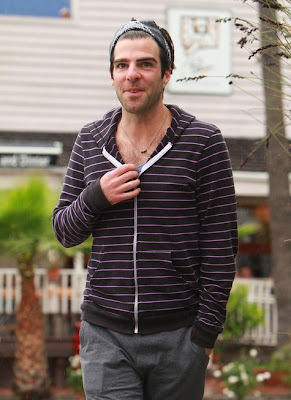 In the wake of gay New York teenager Jamey Rodemeyer’s suicide last month, Zachary Quinto had a crisis of conscience. He realized that hiding his own sexuality was doing nothing for the greater cause of hope and acceptance. The Heroes and Star Trek actor, 34, who came out as a gay man in a New York magazine interview this week, explained that decision Sunday in a candid blog post on his website. Rodemeyer, 14, of the Buffalo suburb of Williamsville, N.Y., killed himself on Sept. 18 after years of bullying by classmates. Quinto says he felt “indescribable despair” when he learned that Rodemeyer had made a video just months earlier for the “It gets better” project – the nationwide initiative to give hope to gay youth. when i found out that jamey rodemeyer killed himself – i felt deeply troubled. but when i found out that jamey rodemeyer had made an it gets better video only months before taking his own life – i felt indescribable despair. i also made an it gets better video last year – in the wake of the senseless and tragic gay teen suicides that were sweeping the nation at the time. but in light of jamey’s death – it became clear to me in an instant that living a gay life without publicly acknowledging it – is simply not enough to make any significant contribution to the immense work that lies ahead on the road to complete equality. our society needs to recognize the unstoppable momentum toward unequivocal civil equality for every gay lesbian bisexual and transgendered citizen of this country. gay kids need to stop killing themselves because they are made to feel worthless by cruel and relentless bullying. parents need to teach their children principles of respect and acceptance. we are witnessing an enormous shift of collective consciousness throughout the world. we are at the precipice of great transformation within our culture and government. i believe in the power of intention to change the landscape of our society – and it is my intention to live an authentic life of compassion and integrity and action. jamey rodemeyer’s life changed mine. and while his death only makes me wish that i had done this sooner – i am eternally grateful to him for being the catalyst for change within me. now i can only hope to serve as the same catalyst for even one other person in this world. that – i believe – is all that we can ask of ourselves and of each other.